I finally got this tutorial worked out. It swelled to about 3 times as big as I expected (which is typical for me) and this is only part 1. Hopefully there's stuff in there for newbies and veterans alike. Comments are welcome if you think something is unclear, or you think I'm full of it. A few months ago a camera crew from Good Morning America showed up at Pixar to interview Brad and film some of the production on Ratatouille. 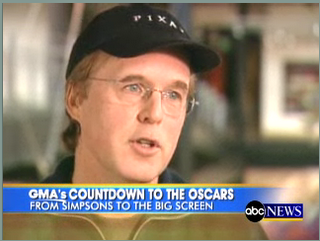 This clip contains some never-before released footage from the film, as well as a peek inside of Pixar. Here's a supporting article on ABC's site. By the way, I'm almost ready to post the next tutorial on splines that I mentioned way-back-when. I've just got a few Quicktime embedding issues to sort out. Check it out! This was animated by Doug Dooley last year and is not actually a scene from the film. Aardman Animations is continuing its full-scale deployment of television content with a new interstitial series titled Purple and Brown for Nickelodeon U.K. Created by Aardman's Richard Webber, the ten one-minute shorts are set to launch on the kids' channel on Feb. 13 and are now available for download on Nickelodeon U.K.'s broadband video service, TurboNick. 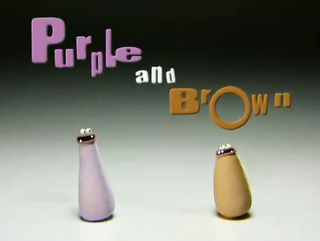 Purple and Brown are two comical stop-motion characters who live in a world populated by other equally weird and wonderful plasticine characters. In each episode, they greet their new friends with infectious laughter and an innocent curiosity, which always ends in one or both of them sustaining a considerable degree of injury. The series is exec produced by Nickelodeon's Howard Litton, along with with Aardman's Miles Bullough, David Sproxton and Peter Lord. Webber, whose animation credits include Creature Comforts, Angry Kid and Morph, writes, directs and provides voices for the interstitials. Aardman recently sold its clay-animated Creature Comforts television series to U.S. broadcaster CBS, which will air an Americanized version as a 2006-2007 midseason entry.